Simple Hitting slump tips: Batting coaching from the bleachers is harmful. Every hitter needs hitting slump tips from time to time. Too much batting advice during in-game play can be more harm than good and likely will prolong a hitting slump. 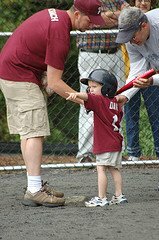 Often, the adult baseball coaches try to help with constant advice at too fast a pace. Especially during the actual baseball game. And then, the bleacher creatures start adding in their two cents. 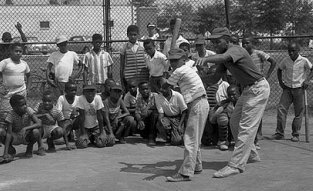 Before you know it we have everybody in town trying to tell the hitters how to get out of a batting slump. Hitting is a very fast reacting activity. It takes many, many at-bats to develop hitting skills and pitch judgments. Professional baseball coaches know this. They work on hitting skills and drills during practice and let the players do their thing when they get up to bat. Encouraging words only. Pumping players up...not ripping on them for every little twitch or glitch. Top baseball hitting slump tips begin with teaching baseball at practice and letting the players play during the games. Name one other sport where you hear or see this kind of pitch-by-pitch, step-by-step adult advisors critiquing each portion of the baseball swing and hitting slump tips. In tennis everyone is quiet before the serve. In golf everyone is quiet prior to the swing or putt. You do not hear anyone coaching a basketball shooter before they shoot or a hockey player shooting a puck. Could you imagine a pro golfer on the tee or putting green and everyone was ‘helping’ them out. The caddy, their swing coach, the gallery, and the TV analysts all piping in with advice. We have mentioned several times in our guide on baseball coaching and baseball articles how detrimental and harmful over-coaching can be to young ballplayers. Giving hitters, pitchers, catchers, infielders, outfielders and baserunners too much advice at one time creates mind-clutter. Baseball players just cannot perform freely with too many things to think about at once and try to play baseball. You see too much coaching especially when batters are at-bat, pitchers are pitching and catchers are behind the plate. We know that youth baseball coaches are notorious for over coaching and/or nagging on the negative stuff. Now, you add the parents and spectators from the bleachers adding their two cents and we really get information overload. "You can't think and hit at the same time." Yogi Berra. Recently, I witnesses this multiple on field onslaught of over advice combined with all the bleacher ‘helper coaches.’ I was umpiring a 7 year old pitching machine league game. Naturally the firstbase coach and the thirdbase coach gave each hitter their hitting clinic advice tips before and after each pitch. Then the other two coaches in the dugout would add some more hitting tips between every pitch. Not encouraging words like, “give it a ride” or “take a swing at it. Now that’s the way to swing it. ”No, No. Expert hitting coaches would tell the hitters, “not to swing at the first one’, or “move up in the box,” “Now bend your knees and get that elbow up, squish the bug” and “Hey, you got watch the ball hit the bat.” Too much helping with hitting slump tips. Furthermore, to pile on the hitter even more, the adult baseball pitching coach feeding the different pitches into the pitching machine had to perform a hitting clinic himself giving batting tips between every pitch. It is just relentless the onslaught of well meaning but extreme over advising on our batters. Then immediately after the pitch the post swing Oohs and Aahhs start in. “What are you doing swinging at the high one. I just told you not to swing at the high one. After taking the punishing tongue lashing from the on field staff and not to be outdone, here comes the verbal lashing from the bleacher creatures. You want to put a duct tape gag on every adult in the ballpark. The damage the adults are causing is enormous on our kids. Well meaning but ignorant of the fact that they are bombarding our young baseball players with coaching over-load. You simply cannot hit freely and relaxed in game speed competition and be mentally thinking of this many things. Best hitting slump tips…Stop coaching during the games and let the players play. Thanks for spending time here at coachandplaybaseball.com. Please stop by and visit again, bookmark, add a comment or question and share us with your baseball friends.